Spicules are one of the most active research subjects in solar physics, but also one of the most thorny. These chromospheric structures correspond to cool and dense jets of plasma that protrude into the corona, often in a ballistic trajectory. They are thought to constantly refill coronal loops with plasma. Because they are everywhere across the solar surface, and because they are highly energetic, their importance has been highlighted for studies of both the chromosphere and the corona, making them also a subject of great debate. Of particular relevance is the unsolved problem of how the corona is heated, and an attractive theory is that spicules funnel most of the energy into the corona and that the heating mechanism already operates in the spicule . The high energies of spicules manifest in their large swaying motions with amplitudes of a few 10 km/s, which suggest an Alfvénic wave driver with large enough energy flux up into the corona (on the order of 106 erg cm-2 s-1). Alfvénic waves are transverse MHD waves (whose main perturbation is transverse to the magnetic field) who have as main restoring force the magnetic tension force. Among these waves is the kink wave, which is characterised by being able to displace the entire flux tube in which the spicule exists . The swaying motion of the kink wave induces shear flows at the edges of the flux tube that are expected to lead to Kelvin-Helmholtz instabilities [4,5]. The resulting vortices are known as Transverse Wave Induced Kelvin-Helmholtz rolls (TWIKH) and are very efficient at mixing the plasma external to the spicule with the internal plasma . Furthermore, the TWIKH rolls generate a turbulent-like state with a cascade of the wave energy to smaller scales and eventual dissipation in the myriads of current sheets and vortices . TWIKH rolls, therefore, constitute a potential dissipation mechanism for kink waves that could play a role in coronal heating. 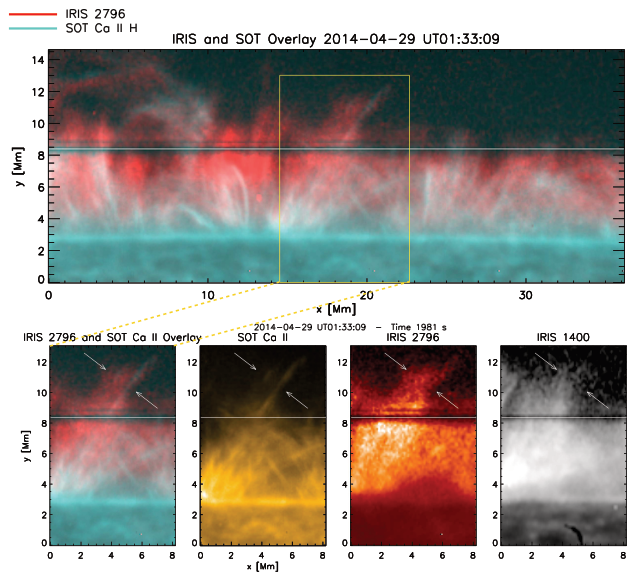 In this work  we analysed coordinated observations of an off-limb region near the north pole of the Sun (see Figure 1) made with Hinode/SOT imaging in the Ca II H spectral line that forms at 10,000-20,000 K, and with IRIS, an imaging spectrograph, here observing in the Mg II k line formed at 15,000 K and Si IV line formed at 100,000 K. This coordinated observation allowed a high resolution and multi-temperature view of several spicules during their evolution. Figure 1. (Upper panel) A composite image of IRIS SJI Mg II k (red) and Hinode/SOT Ca II H (turquoise). The field-of-view (FOV) corresponding to the lower panel is marked in yellow. The white line indicates the location of the IRIS slit. (Lower panels) From left to right, composite image of IRIS SJI Mg II k (red) and SOT Ca II H line (turquoise), the corresponding SOT image in the Ca II H line (yellow), the SJI Mg II k image (red), and the SJI Si IV image (gray). A spicule is observed (marked with arrows). The spicule shown in Figure 1 highlights one of the main characteristics of the spicule: it is multi-stranded when observed at high resolution (SOT view), while it appears monolithic in the IRIS channels. The ensemble of strands sways transversely and in-phase, suggesting a kink mode. The multi-stranded nature is particularly clear during the swaying. Thanks to the location of the IRIS slit (white horizontal line in Figure 1) we could record the spectral signatures during the swaying. Note in Figure 2 that during the transverse oscillation large variations in intensity are observed in the chromospheric lines. The Doppler shifts change sign at times of maximum displacement. Also, the location across the spicule where the transition occurs appears ragged. Furthermore, the line widths increase during the oscillation. Figure 2. (Upper panels) From left to right, time-distance diagrams at the IRIS slit location for SOT Ca II H line intensity, the SJI Mg II k intensity, the Doppler velocity, and line width in Mg II k. (Lower panels) Four-set on left: time-distance diagrams of the modelled spicule at 45 degree line-of-sight (LOS) and at numerical resolution for the cross-section cut at z=11 (red line in Fig. 3) for several quantities. RT denotes a radiative transfer calculation. Four-set on right: Same quantities but now taking into account the instrumental resolution (spatial, spectral and temporal) and a LOS matching the observations (135 degrees). 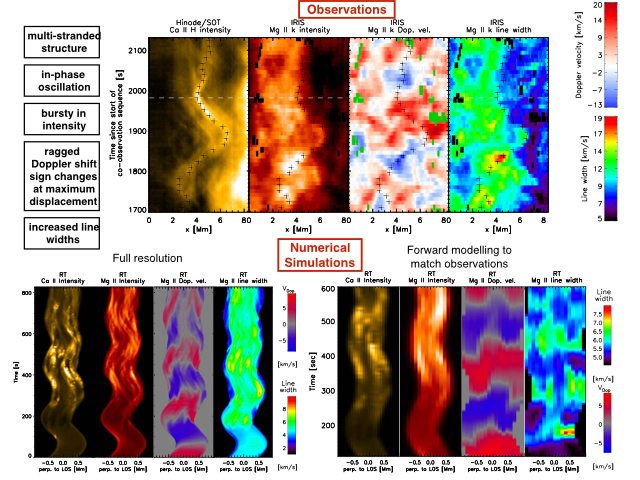 In order to test the role of the kink wave on the observed signatures, we performed 3D MHD simulations combined with radiative transfer and optically thin modelling of a spicule-like structure undergoing a kink oscillation. The spicule consists of a density-enhanced (x50 -> 6×1010 cm-3), colder (1/100 -> 104 K) and low-beta structure with respect to a coronal background. There is a smooth transition between the external and internal plasma, with a slightly enhanced internal magnetic field to keep hydrostatic balance. The spicule is connected upwards with a coronal loop through a transition region (see Figure 3). Figure 3. Five-set on left: perpendicular cross-section of the spicule model at a height of z = 11 Mm for several quantities. Four-set in middle: side view of the simulated spicule along the plane of oscillation for several quantities. For the magnetic field strength and current density the average along the y axis is shown. 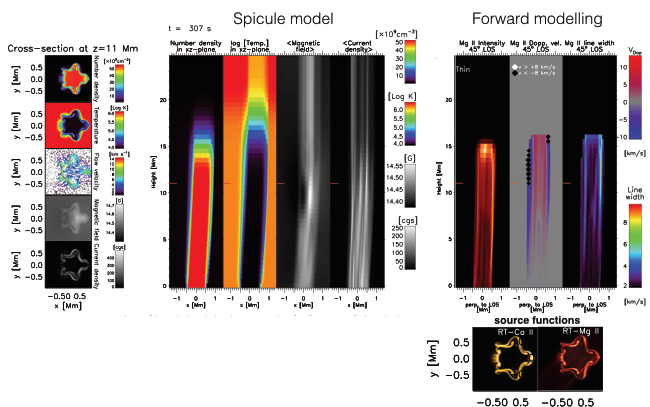 Four-set on right: forward modelling taking a side view of the simulated spicule at 45 degree LOS for the optically thin calculation. The lower 2 panels on the right show the cross-section of the source functions for Ca II H and Mg II k.
The spicule oscillates in the fundamental kink mode with an amplitude of 12 km/s in the top part of the spicule, and a period of 255s. After half a period TWIKH rolls are produced that deform and locally twist the spicule. Strong currents are produced that propagate as Alfvénic perturbations. The TWIKH rolls produce density-enhanced regions that appear as strands in the synthesised chromospheric lines. Because of the collective nature of the kink mode, the strands oscillate mostly in-phase (see lower panels of Figure 2), but a ragged transition in the Doppler shifts is generated because the TWIKH rolls lie mostly at the surface of the spicule, where strong backward flows exist (fuelled by resonant absorption). The Doppler maps also appear stranded because of the distinctive velocities of the TWIKH rolls. Furthermore, since rolls exist at multiple scales (with different dynamics), high-frequency Doppler shifts and increased line widths are produced. The Ca II H source function (see Figure 3) in this model has an annular shape. Because of the strong density and temperature variations at the edge of the spicule due to the TWIKH rolls, this source function varies strongly, generating a bursty intensity evolution for this line. On the other hand, the mixing from the TWIKH rolls and the wave dissipation is not enough to produce an increase in intensity in hotter lines as is usually observed. On the other hand, our model fails to increase the spicule temperature enough to account for the observed increase in transition region and coronal lines. This is likely due to the simplicity of our model and suggests other mechanisms at work .